Midnight Hollow was known for its eccentricity. For years, it proved to be a safe and comfortable city of refuge for Olive Specter. After placing her three favorite “trophies” in her new yard, the place felt just like home. 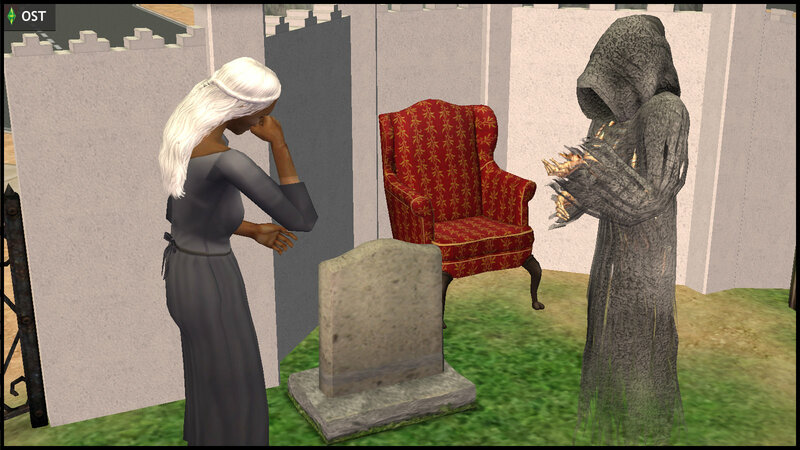 By this time, the Grim Reaper, Thanatos Grimm, finally decided to reciprocate Olive’s special feelings towards him. Olive knew that this romance was different, for two reasons. Firstly, despite being married more than once, her only significant woohoo memory was with Thanatos, whom she was not married to. Olive was bemused at how messed up her love life was. Secondly, if Thanatos Grimm annoyed her, she definitely could NOT kill him. So Olive had finally found a formidable lover whom she had a genuine deep connection with, and considered to be an equal. was sad, because she knew she could not possibly become Mrs Grimm, since Thanatos was not mortal. Thanatos suggested that they could “have another round”. This time, he would “give her something to remember him by”. Olive was not sure whether to believe him or not, but she enjoyed the moment with every fiber of her being. Decades later, she would still be replaying this encounter over and over in her head, as one of her favorite memories. So when Olive’s belly became enlarged, she was surprised, as she didn’t expect that a supernatural being could give her a child. When her baby boy was born with skintone 1, she was even more bewildered, since this was too far apart from her family’s usual skintone 4. But this child was of supernatural origin, so Olive concluded that typical DNA mixing rules may not apply in this case. “NERVOUS”… and the nickname stuck, regardless of the filler “proper name” she had to declare on his birth certificate. Olive loved her son. She thought her life was finally complete, with the son from the love of her life. Alas, life was not perfect, because Olive had an ongoing grudge against the “perfect mother” Jane Doe, a resident of Midnight Hollow. From the outset, Mrs Doe had taken an instant dislike to Olive and Nervous, and had the habit of making fun of them, ruining many nice outings at the playground. Olive bit her lip throughout all these insults. She dared not risk reacting, or it may trigger her old murderous tendencies. She had to think about Nervous. When that was not enough, Jane Doe decided to call Social Services, greatly exaggerating the matter of Olive’s alleged “abuse” of her child. The Social Workers took this “worried” call for granted. That was the last line Olive heard from her toddler son, while sobbing as if her world had collapsed. This was the last straw that broke the camel’s back. Olive decided to take revenge on Jane Doe. After all, “charm” was worthless when Mrs Doe was dead. Olive had originally intended to kill only Jane. But Jane’s husband, John Doe, and all their kids came home at the wrong time. The only witness, Lucien Hyde, a Midnight Hollow resident, only saw Olive coming out of the Doe house. At that time, he had no idea why Olive was there. Even when the police appealed for witnesses to come forward, Lucien Hyde decided to stay silent, because he did not think this matter was worth his time. There was no time to collect trophies from the Doe house this time. Olive had to pack up and leave again, in case the cops decided to pay her another visit. Olive decided to return to StrangeTown. After extracting all her other hidden “trophies” from the creepy underground vault, she arranged them all nicely outside her new home in 13 Dead End Lane – the estate which would be later known to the other StrangeTown residents as “Specter Yard”. Olive took a short holiday in the island of Gastrobury (^). While feasting at the “Chef Gino” pizzeria, she met Ichabod Specter. Olive immediately felt a genuine connection towards Ichabod, something she never felt with any of her former husbands and ex-fiancé… but this was similar to what she felt towards Thanatos Grimm. Perhaps Ichabod’s surname, “Specter”, played a part in this impression that she was meant to be with him, since she had an affinity for the names “Spectra” and “Specter” long before she even met Ichabod. When Olive told Ichabod she was going back to Strangetown, he immediately told Olive he was coming with her, leaving the beautiful medievalesque island behind with all its great recipes and the legendary “Gastro-Fest” (^), to live with her in a desert town with a graveyard. But that did not bother Ichabod. As Olive was already an elder, Ichabod was clearly not looking for an heir. All he wanted was to be with her, and to set up a restaurant one mile outside Strangetown. However, the latter never came to pass. The Specters spent one happy year together, before Ichabod died peacefully of Old Age. Olive was devastated. She had never felt such grief before, because she never before felt such a deep connection with a mortal man. Of course, this was the time for her immortal lover to appear. 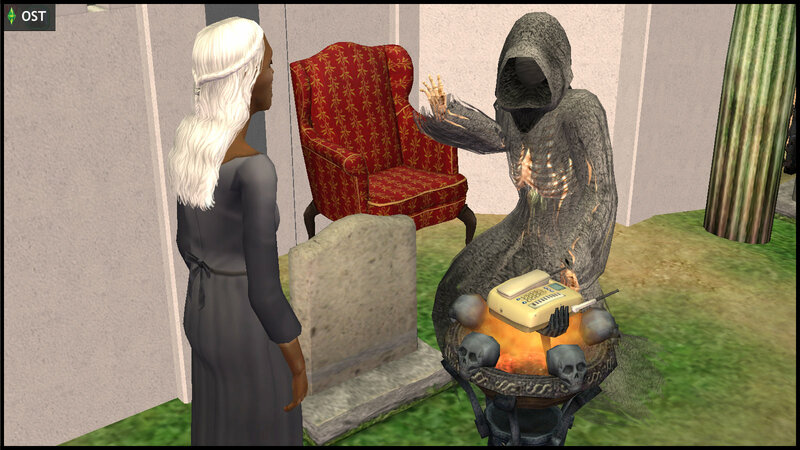 With a whiff of his scythe, Thanatos Grimm produced a skull phone, and presented it to Olive Specter. With that, the Grim Reaper disappeared again, leaving Olive to inspect his latest gift. She was still grieving too deeply to make much sense of the supernatural contraption before her. The loss of Ichabod, the only husband Olive ever loved, felt like retribution for all her past bloody deeds. She decided to honor her short marriage by using Ichabod’s surname, Specter, sometimes in place of her own first name. 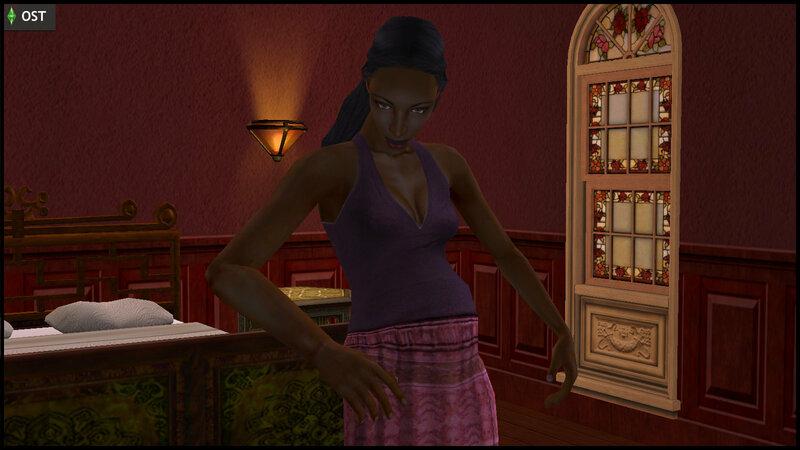 That is why the Strangetown residents sometimes refer to her only as “Specter”, instead of just “Olive”. (#) Nervous’ last cry for help as a toddler is almost identical to the first plea that Olive heard from him as an adult in [STSYC #1]. Prior to Midnight Hollow’s release, fans have suggested different birth names for Nervous Subject, ranging from Osiris to Neville, since “Nervous Subject” was logically interpreted as a cruel nickname from the Beakers, instead of a proper name given by his mother. 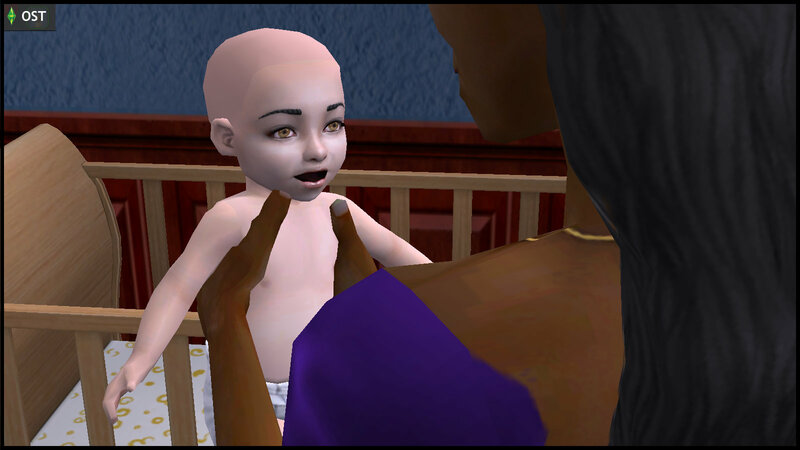 Likewise, it is probably a marketing reason behind the choice to retain the name “Nervous Subject” for this character at this early life stage in Midnight Hollow, so he is recognizable alongside his mother. Fixing a canonical “proper birth name” for Nervous also risks invalidating the many fan fiction tales written before Midnight Hollow’s release. So in STSYC, the authors chose a middle-ground approach, so that “Nervous Subject” is a nickname that Olive had already used on her toddler son, used so often that his “proper birth name”, if any, is forgotten and irrelevant in this tale. How much does Olive miss having a child in her life? Will old age mellow her murderous instincts? It’s sad that Olive’s happiness was rarely prolonged. Sometimes I wonder if she would have even gone down this dark path if she had been a happy person in the first place. 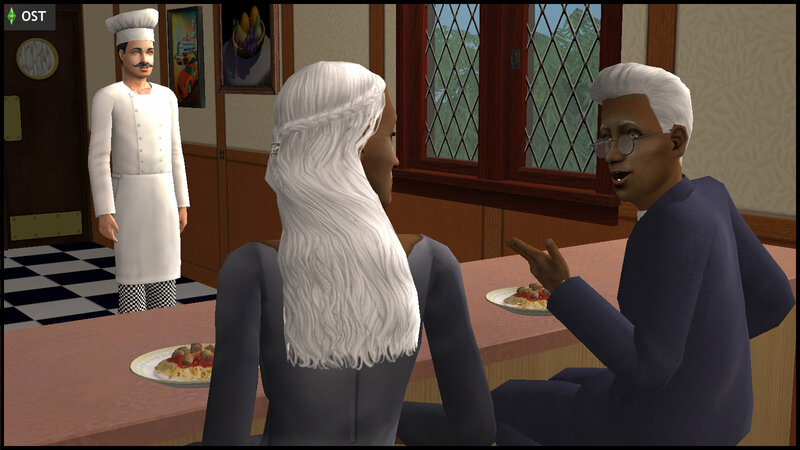 In sims 2, there’s a canon family album pic of olive and ichabod getting married as elders, albeit without the nigmos family clearly in attendance. 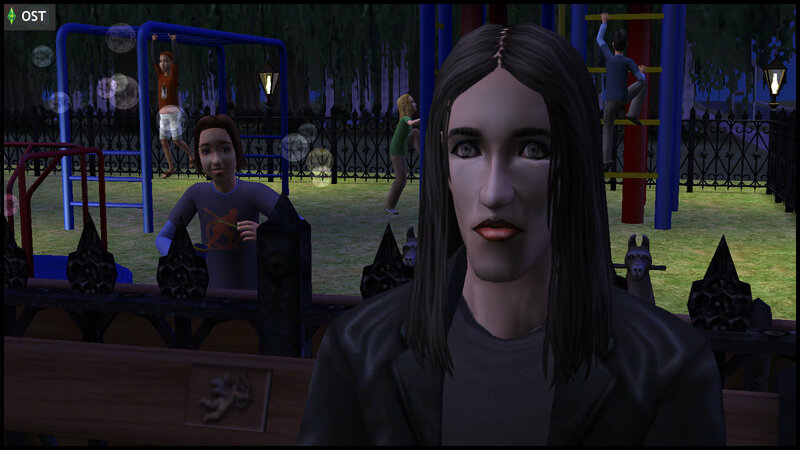 The sims 3 midnight hollow retconned timing of ichabod’s death to be before or around the time of nervous’ toddlerhood may have contributed to that impression. Strangely Jennifer Doe (I think that’s the child’s name) is smiling and crying at the same time. Perhaps their perfect life already had holes in it. Having Racing men and Hyde in the background is both interesting and mildly amusing. I wonder how Willow and Creon will die in this story. 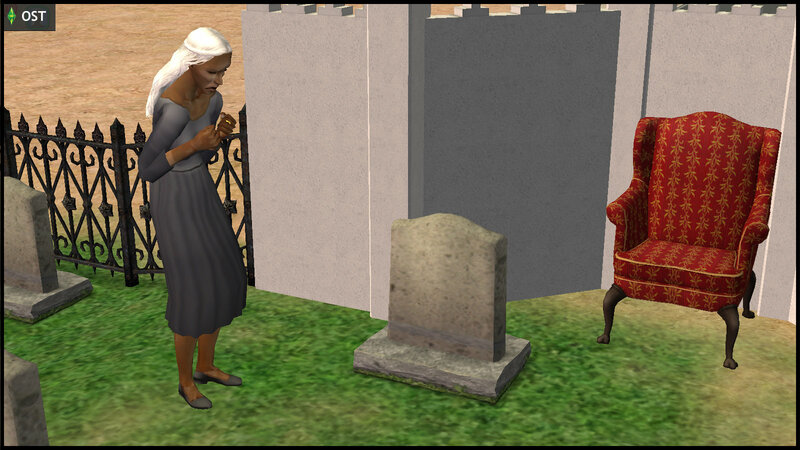 This version of the Doe family (recreated in sims 2 by sims2player) has their “neutral” expression tilted upwards in perpetual smiles (see their newly added family shot in STSYC 3). Interesting interpretation that their so-called perfect lives aren’t actually perfect, which is usually true anyway. 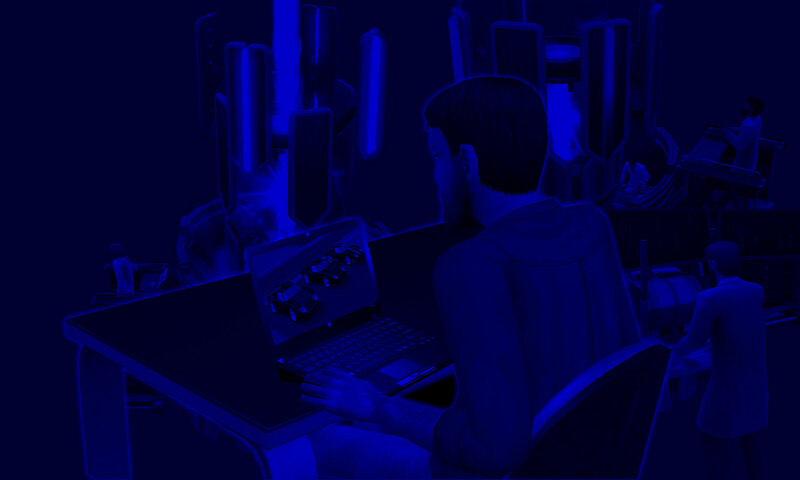 Midnight Hollow is the earliest time period in OST that the RM could possibly crash, if we wish to avoid a time anomaly like in GODP 2 (I disguised the teen cameos more heavily because the RM are not supposed to be in Daniel Pleasant’s age group). But the RM are indeed slightly older than Nervous, so the playground was the right place.